The palm sander market is a tough one for potential buyers to figure out. The different sanders look very similar, and their stat lines are almost identical. After having reviewed all leading sanders on the market, I can speak to the little differences that make each sander feel unique. Let's take a look at your choice of palm sanders in 2014. The market is full of well-built palm sanders that perform well in the woodshop. All have quirks, and some do one thing better than the rest. 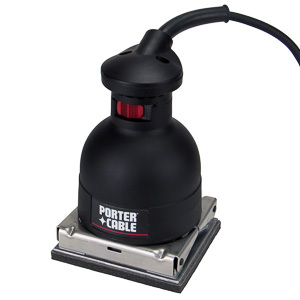 The Porter Cable Model 330 is the heaviest 1/4 sheet sander on market. Its build quality is a notch above the others. The awkward metal sand paper clamps take some getting used to, but they make up what they lack in usability with unmatched durability and holding power. Unlike the competition the Model 330 does not have a knob handle. It must be held with a hand wrapped around its base. The surprisingly weak motor places the Model 330 in the middle of pack in our speed tests. It works best when used in short bursts, which hides its lack of top-end speed. Its excellent durability makes it one of the best sanders for use in a commercial shop. The Ryobi S652DK is the budget option in this comparison, but not necessarily the weakest one. On any given project it is hard to notice a difference between this sander and any of the other sanders on this list. 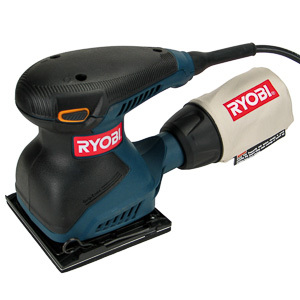 Its powerful motor, comfortable handle, and decent sanding speed leave little to be desired on small to medium sized projects. The weak sand paper clamps and liberal use of plastic around the base plate define the limits of the S652DK. It'll do well when used occasionally, but will wear out quickly when used in a commercial woodshop. The S652DK is a great sander for beginners looking to save money, but there are better options for anyone looking for a keeper. 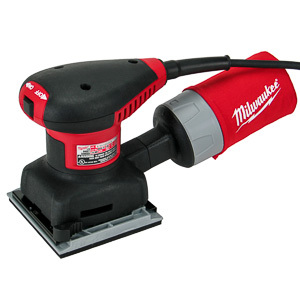 The Milwaukee 6020-21 is the most capable 1/4 sheet sander on this list. It combines excellent build quality with unmatched performance. A powerful motor and competitive top speed propels this sander to the top in our sanding speed tests. Unfortunately the horrible sand paper clamps all but ruin this sander. They are unintuitive, difficult to close properly, and have questionable a service life. If it was not for these clamps, the 6020-21 would be one of the best sanders on the market. Adventurous users who seek the performance peek at the cost of some serious annouances can risk taking look. The Bosch 1297D is an average sander that does everything right. With this sander the engineering team at Bosch managed to produce results comparable to the competitions' at a much lower noise level. Add to that the fastest, most convenient sand paper clamps in the field, flawlessly prepared surfaces, and an excellent dust collection design, and you have a compelling package. In the woodshop the 1297D won't let you down, but one can't help but wonder if there is a better way to do the work. 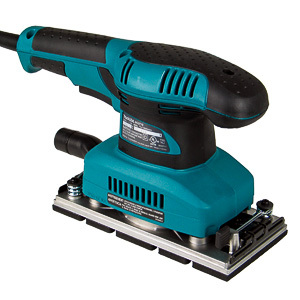 This sander's quirks are not as pronounced as those of the competition, but its highs are not high as well. 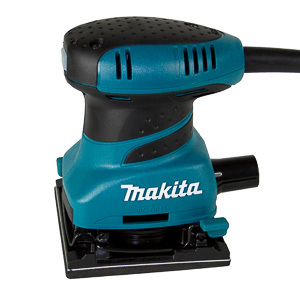 The Makita BO3710 sander made it onto this list due to its competitive price. For only a little more money you get the extra performance the larger 1/3 sheet offers. In the woodshop this translates into a level of performance no other sander on this list can match. The BO3710 sands faster, has better dust collection, and is built as well as all but one of the competing sanders. You'll pay for this level of performance with a reduction in agility. The BO3710 is considerably larger than the 1/4 sheet sanders. When sanding flat boards this sander is hard to beat, but the smaller competition gets into corners much more easily. The Makita BO4556 is as generic as they come, but everything about it is well executed. The traditional wire based sand paper clamps do their job without trying to push the limits of usability. The plastic base plate produces great results, but will likely break long before the competition does. Results come easy, but not at the pace of the leaders of the pack. Infrequent users will notice little difference in the performance of the BO4556 and that of even the best sanders in this lineup. The circular dust port and low price of this sander make it an attractive option for anyone who does not want to deal with the quirks of the competition. Going for the well-executed option in the middle, however, can be difficult to justify. The DeWalt D26441 is the workhorse in this lineup. It's the an uninspired brute of a sander, which is exactly the type of tool a well traveled contractor would want to put into his or her tool bag. Only the Milwaukee 6020-21 sands faster than this one. The simple design fails to impress, but also gives this sander great durability in a hostile environment. 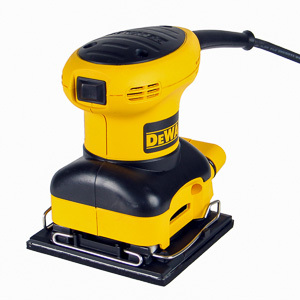 With this sander DeWalt set the baseline the other manufacturers compare themselves to. 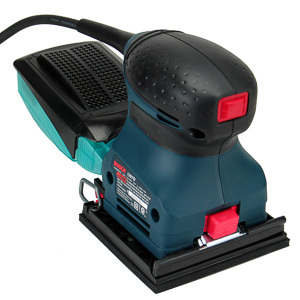 The sander's design has not been updated in years, yet it is still a best seller. The D26441 has a place in any tool collection, may it be the commercial or hobby kind, but there is plenty of room for the next generation of sanders to improve on the design. 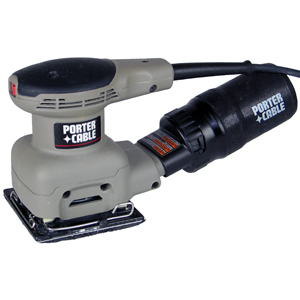 The Porter Cable Model 342 is a nearly identical copy of the DeWalt D26441. There is little difference in performance between the two. The slightly better dust collection canister, longer handle, and better kit box give the Porter Cable the lead in the review score department. At its core, however, the Model 342 is still a simple, but also very capable sander. It's a good choice for just about everyone. The call between this sander and its DeWalt counterpart comes down to what color you like better. 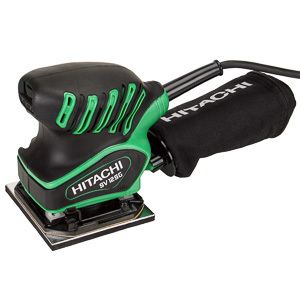 The Hitachi SV12SG is a well engineered palm sander with a serious flaw. Its average size motor and solid top speed place it in middle of the pack. The thick sub base and metal hole punch even give it features none of the competition can match. Unfortunately all this is for naught. Hitachi does not include or sell a vacuum hose adapter that fits onto the sander's oval dust port. Given the solid performance of some palm sanders on this list, why would anyone buy a sander that does not have a good dust collection option? The 1/3 sheet Makita BO3710 is the best all-around palm sander in this lineup. Better engineered than the competition in almost every way, its only drawback is its considerably larger size. Best of all, it sands significantly faster than the closest competitor. The foursome of the Bosch 1297D, Makita BO4556, DeWalt D26441, and Porter Cable Model 342 defines the middle of the pack. 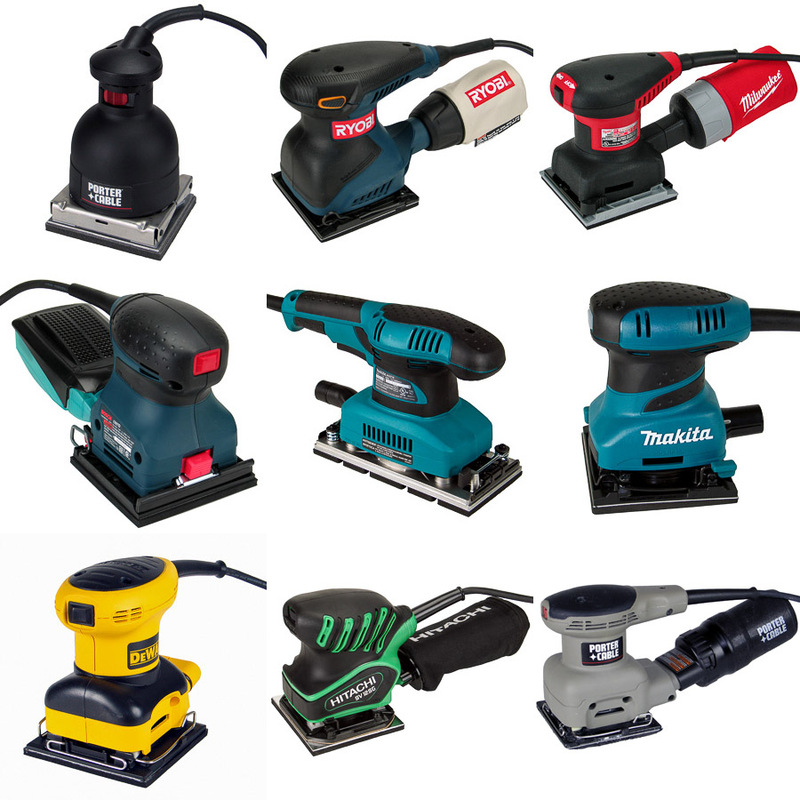 Each one of these is a capable sander that will perform well in any woodshop. Choosing based on brand loyalty is not a bad strategy in this segment. The Porter Cable Model 330 takes the durability crown, but fails to outperform the generic sanders in the middle of the market due to its lackluster motor. It's the best choice for anyone who values durability above everything else. The seriously flawed Milwaukee 6020-21 and Hitachi SV12SG, and the low-quality Ryobi S652DK sit at the rear of the field. While they are still capable sanders, the competition is simply too strong to recommend these two sanders. If the price is right, they may still be a good pick-up.